(WBIR - North Knoxville) Knoxville police said a homeless man was found dead Thursday morning in a creek on Atlantic Avenue. Darrell Debusk with KPD said the man's friend found him this morning and went into a business to call 911. The friend told investigators they had been drinking together Wednesday night. It appears the man fell into the creek, but did not fall over the bridge, according to Debusk. He said no foul play is expected and there are homeless camps along the creek. 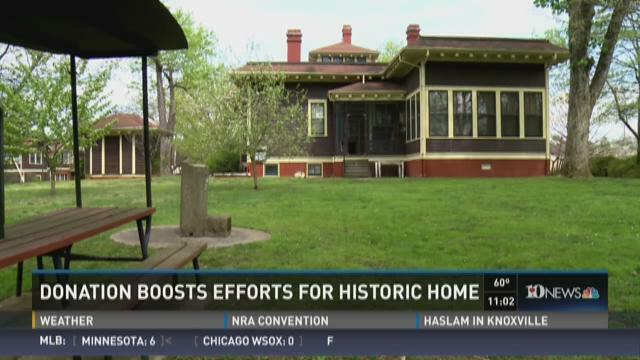 (WBIR - North Knoxville) A Knoxville group working to save a historic home saw big boost to those efforts this week in the form of a surprise donation. A $100,000 pledge came with a goal of saving the historic Howard House along north Broadway. The Knox County District Attorney General's Office said Thursday it won't file charges against an owner of a liquor store who fired a warning shot into the air after an armed man apparently tried to rob his business. Initially Knoxville police said the business owner, Modupe Osaro, fired his gun at two shoplifters as they ran from his North Knoxville store. Two people were shot, including an innocent bystander, during robbery that involved drugs at a north Knoxville apartment complex late Monday night, according to a Knoxville Police Department release. Firefighters are investigating what started a fire at a Fountain City house early Monday morning. Just after 5 a.m., firefighters were called out to a home on Garden Drive. Two adults living in the basement ran through the flames to alert the family living in the upstairs unit. Everyone managed to get out of the house safely, but firefighters said a pet was missing. Investigators believe the fire started in the basement of the home, but no word on how it started.